Holiday.gr - Oia, a trip to a myth! 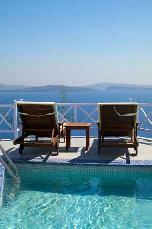 Oia is a cosmopolitan resort in Santorini. It is widely known for its dream-like sunset. Every dawn people gather in caldera to see that magic moment where the sun disappears in the endless Aegean open sea which takes the reddish colours of the day as it goes by. Oia is built on a height of 350 m above the level of the sea and is sited on the north side of the island, 11 km far from Fira. It distinguishes for its authentic beauty. The carved in rocks settlement, house-caves, that are excavated in rocks, are its characteristic. 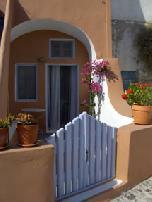 That kind of houses are found only in Santorini, due to its particular kind of ground. Oia is the first settlement in Greece identified as preserved not only for its carved in rocks houses but also for its nobility and unique beauty. Even the latest buildings distinguish for their traditional architecture of Cyclades and their unique appearance. Walking through the picturesque paths, you will find a lot of touristic shops ,coffee houses and restaurants. There are many hotels in the area that provide all sort of comforts to their guests. In the evening you can go for drinks in one of the many bars in Oia and enjoy the view under the candle-light. 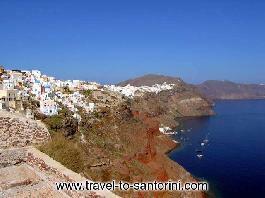 From Oia you can reach the beach of Ammoudi by car or on foot by going down the 214 stairs. You can also swim at the beach of Armeni by going down the 300 stairs. Southeast of Oia is located the beach of Koloubos. It is a quiet beach with pebbles. Been to Oia ? Share your experiences!